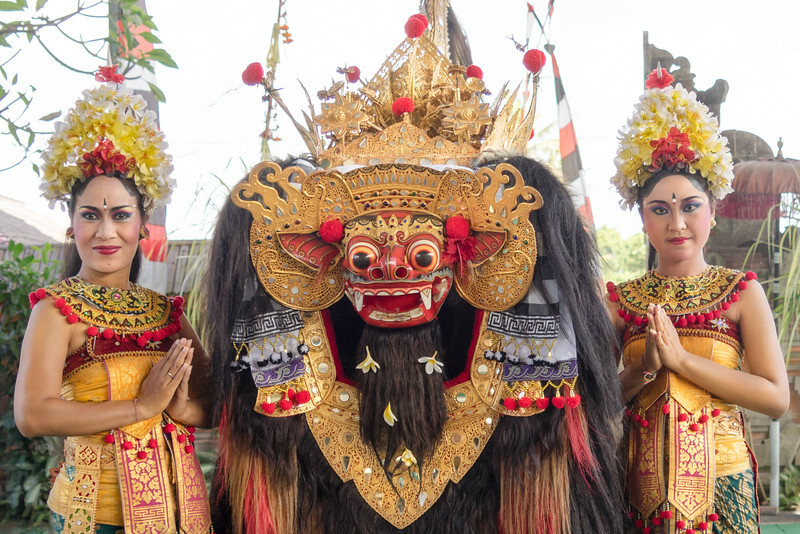 The Barong & Kris Dance is a traditional Balinese dance drama portraying the eternal battle between good vs. evil from characters in Bali mythology. Barong, is a lion-like creature, is the king of all good spirits and Rangda, is a widowed witch and the queen of all evil spirits. 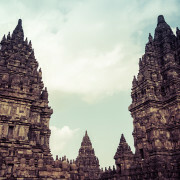 Both are equally revered and worshipped amongst the Balinese Hindus as one cannot exist without the other. 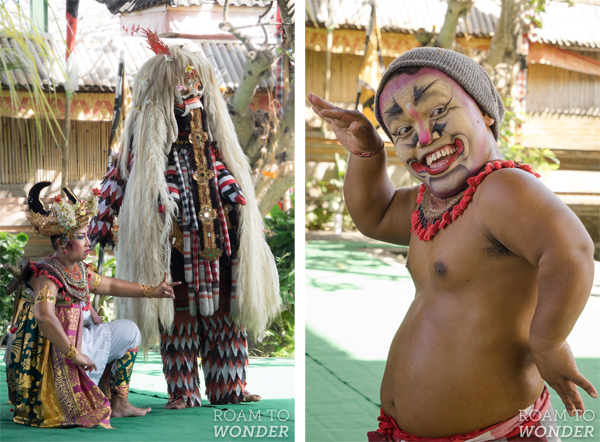 The backstory of Barong and Rangda is explained below. 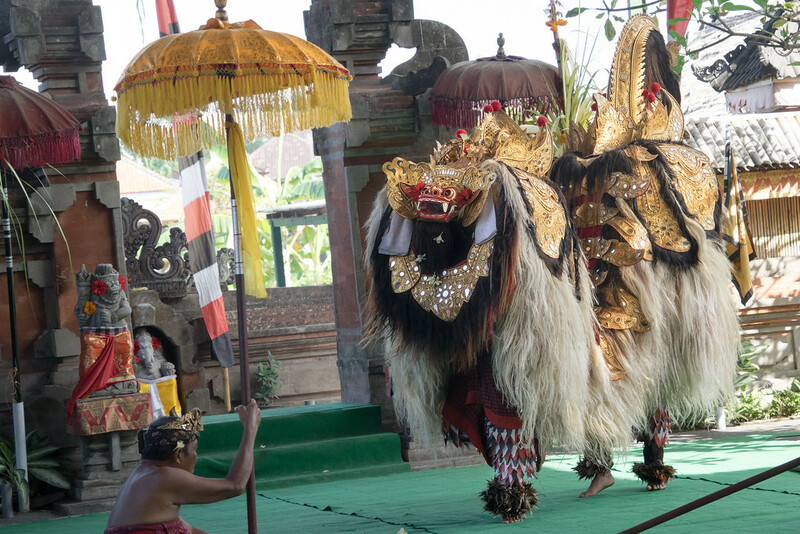 The drama we watched is depicted in five acts in Indonesian and features a Balinese gamelan orchestra, Balinese dancers, actors in full traditional costume, and sword-wielding Kris dancers. For those who do not understand Indonesian, there is an English translation that explains what is happening during each act which I have re-written and included below. The original translation was hard to follow and to fully understand the drama, the storyline needs to be understood before watching. 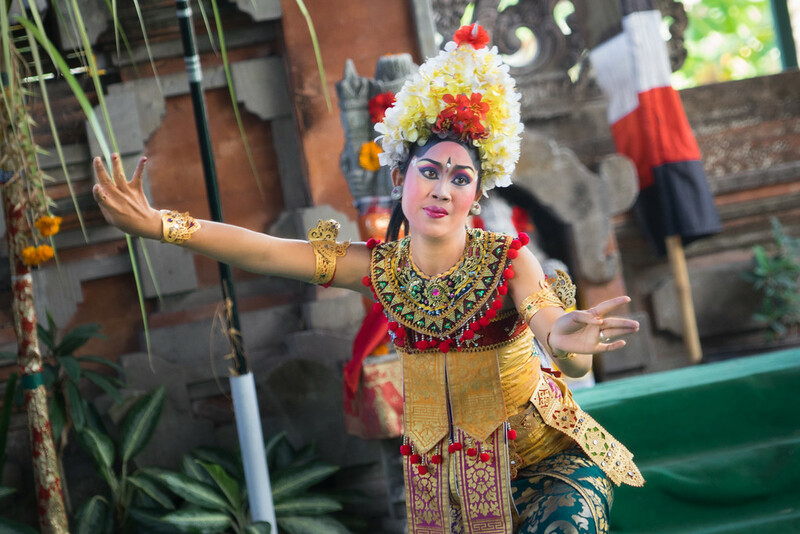 The dance show can be viewed daily from 9:30-10:30am in Ubud in the Gianyar area for IDR 100,000 and comes highly recommended to watch to enjoy Balinese culture. 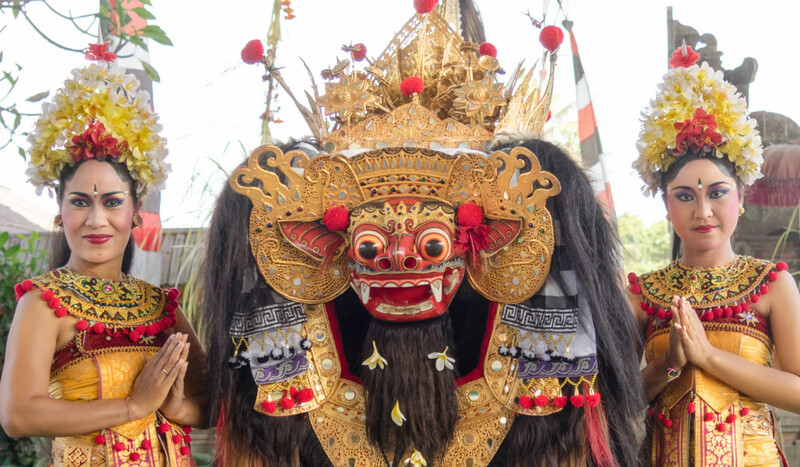 Barong is the king of good spirits and is portrayed as a fun-loving, lion-like creature with a red head, covered in thick white fur, wearing gilded jewelry adorned with pieces of mirrors. 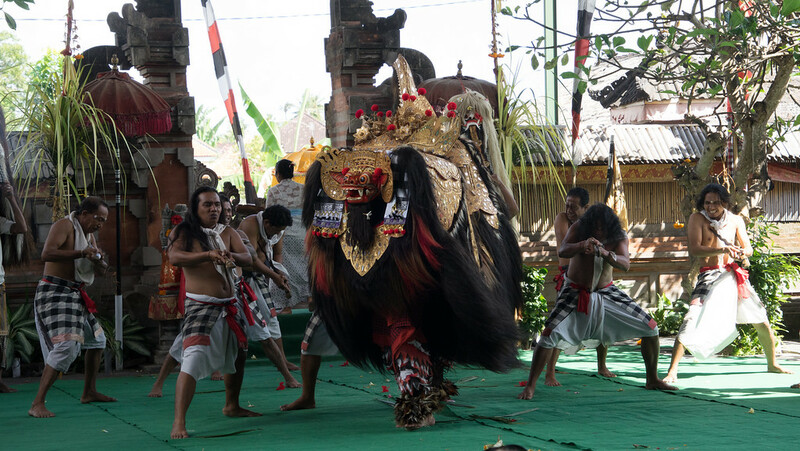 The term barong is derived from local term bahruang which today corresponds to Indonesian word, beruang which means bear. The origins of the Barong are quite uncertain as its origins could be from animist worship before Hinduism appeared when villagers still believed in the supernatural protective power of animals. Rangda, is the mother queen of all the evil spirits with an army of demons and evil witches who practice black magic at her disposal. She is depicted as an old woman, with long and unkempt hair, pendulous breasts and claws, and her face is traditionally portrayed with fanged teeth and a long, protruding tongue.The name Rangda in old Javanese and Balinese language means widow. 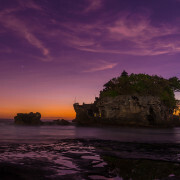 Rangda’s origin was linked to the legend of Calon Arang, the legendary witch who wrecked havoc in ancient Java during the reign of Airlangga in late 10th century. 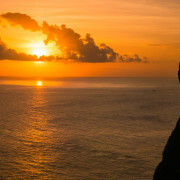 She is also linked to the legend of divorced and exiled Javanese queen Mahendradatta. 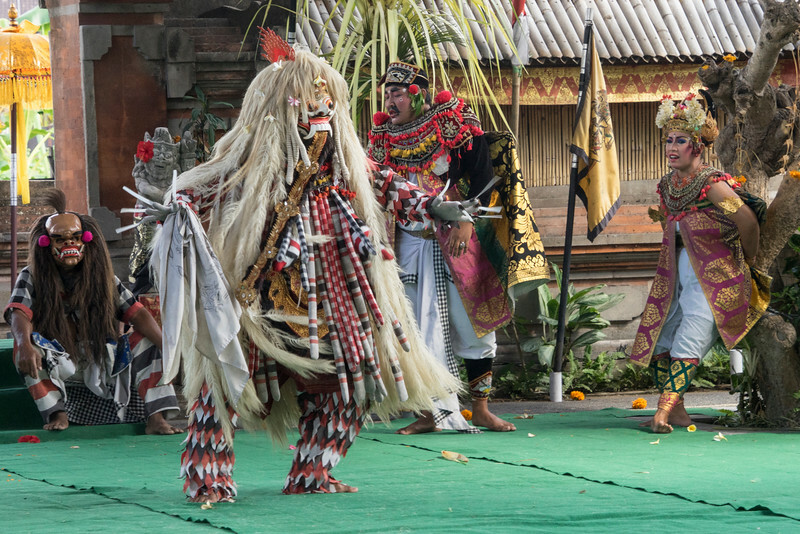 Indonesian dancers in traditional outfits with Barong, the king of good spirits. The monkey and tiger, both friends enter the forest. Three men are seen making and drinking palm wine in the forest and are also servants to Dewi Kunti. They spot a tiger and see it killing a child and the men respond by attacking the tiger to fend it off, but the monkey assists the tiger in the fight. The nose of one of the three men was bitten off and the tiger and monkey escape the scene. Act 1: Two female dancers who represent the servants of the Rangda search for the servants of Dewi Kunti who are on their way to meet their Patih (Prime Minister). One of two dancers, also one of Rangda’s servants shows off her intricate hand movements called mudras, or symbolic ritual gestures similar to classical Indian dance. 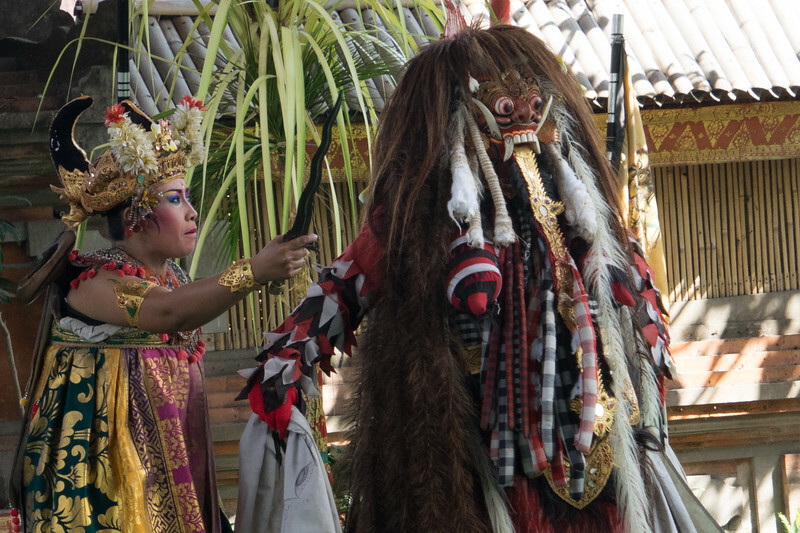 Act 2: Rangda transforms one of her female servants into a witch (who also looks like Rangda) and starts to fight the servants of Dewi Kunti. Dewi Kunti’s servants manage to escape the Rangda and encounter the mischievous monkey again on the trail. This time they defeated the monkey and they make it safely with Patih to later meet up with Dewi Kunti. Barong dance is injected with some humor. The servants of Dewi Kunti (right) and Patih (left) kill the monkey who tries to attack them earlier. Act 3: Dewi Kunti has promised the Rangda to sacrifice Sadewa, her son. A witch appears and ends up possessing Dewi Kunti and she becomes angry and orders the Patih to bring Sadewa into the forest. The Patih is later also possessed by a witch so he does not have pity on Sadewa and continues to take Sadewa into the forest and ties him up to a tree. Act 4: Unknown by Rangda, Siwa, a Hindu God appears and grants Sadewa immortality. 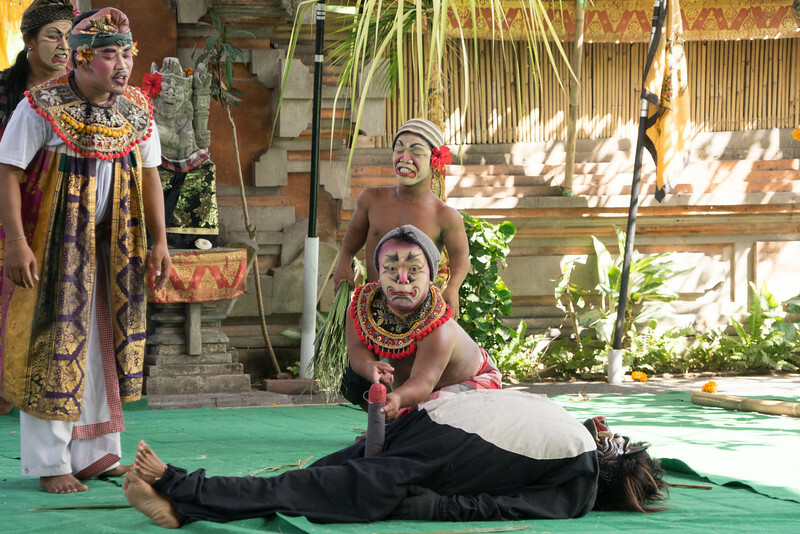 The Rangda appears ready to kill Sadewa to eat him up, but Sadewa is still alive. Rangda then surrenders and asks Sadewa for redemption and Sadewa agrees and kills the Rangda. The Rangda goes to heaven. Act 5: One of the servants of the Rangda called Kalika comes up before Sadewa and asks him to redeem herself too, Sadewa refuses. Kalika gets angry and transforms herself into a boar to fight Sadewa. The boar is defeated. She then transforms herself into a bird but is defeated again. At last she changes herself into a Rangda. Sadewa meditates and then he changes himself into a Barong. Still the Rangda seems to be too powerful for Barong to defeat Rangda and the fight doesn’t seem to end. Followers of the Barong, Kris-wielding dancers appear and help Barong fight Rangda. Rangda puts a spell on the followers to turn their swords to kill themselves, but Barong casts another spell to make them immortal. Ultimately the fight ends and Rangda is scared away. Kris Dancers stabbing themselves with the keris sword. 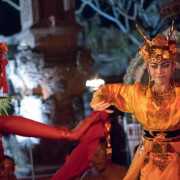 Another equally enchanting traditional Balinese dance to watch is the Kecak dance where hundreds of half-clothed men chant the word kecak to a melody they create with their own voices while the Hindu Balinese epic of Ramayana is portrayed by beautiful Balinese dancers. One show in Central Ubud even had a man who kicked fire under a trance. 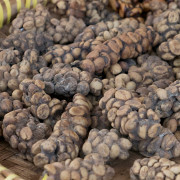 Would You Drink Cat Poo Coffee or Kopi Luwak, a Local Coffee Delicacy in Bali?